We hear it again and again. The disbelief from our customers when they learn they can backup everything their business needs from a single license, at a single affordable price. Server Backup for SQL, Exchange & VMs - All inclusive Windows, server backup for business critical applications & Virtual Machines. We understand small business backup and are here for YOU for everything from choosing your backup plan and installing it, to recovering your data in case of a crash, to providing unmatched local support. NovaBACKUP Business Essentials gives you everything you need to protect all your business data, in one all-inclusive solution. We protect your entire system with a single solution. Our business is protecting your business at an affordable price, with no surprise extras or add-on costs. We protect your entire system (files, applications, operating system) with file backups and Disaster Recovery image backups in one solution. You get award-winning Windows server backup software for SQL and Exchange, plus support for unlimited virtual machines for one price. With NovaBACKUP, you don't need multiple solutions to protect all your business data. One solution does it all. 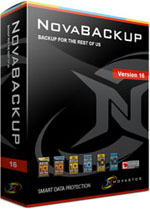 NovaBACKUP Business Essentials offers Windows server backup for both physical and virtual machines a single, all-inclusive solution. Local and cloud backup destinations. It's your data, stored your way. Now you can choose from local or online backup, plus seamless integration with file sharing services like Dropbox, OneDrive, OneDrive for Business, Google Drive, iDriveSync, SkyDrive and SafeSync. One price, one all-inclusive solution. NovaBACKUP Business Essentials gives you everything you need to protect your business files and application data, with a single license and a single installation – for one low price. Works on Windows Server 2012 R2, 2012, 2010, 2008, and 2003, plus supports Microsoft SQL and Exchange. SQL and Exchange server backup. Backup all your data, even Microsoft SQL databases and Exchange servers from the same application, without additional add-on costs or separate plugin installations. Supports up to SQL 2014 and Exchange 2013. NovaBACKUP provides a best-in-class mailbox-level restore for Microsoft Exchange. You can recover entire mailboxes in the event of a crash (including non-mail items like Calendar, Notes, and Tasks), and you can also use single file restore to retrieve individual emails. With the new NovaBACKUP Virtual Dashboard, we’ve taken the complexity out of virtual backup – allowing users to manage, monitor, and control their Hyper-V and VMware virtual machine backups from a single dashboard. NovaBACKUP Business Essentials tested 133% faster than the nearest competitor. And, you can use automatic scheduling to backup bit-level or incremental changes, in between your full backups – ensuring your files and database data is always protected, without needing to continuously run full backups. Business Essentials guards your data with military-grade, 256-bit encryption. Plus, scans ensure that all the crucial data you're backing up will be virus-free when it's time to recover.